This is a very soft, stretchy elastic suitable for baby clothing, or anywhere else - waistbands, sleeves, anywhere you would like softer, stretchier elastic. 67% acetate, 33% rubber. 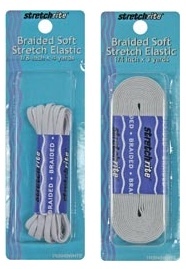 Choose from a 3-yard package of 1/4" or a 4-yard package of 1/8".